Sailing along Turkey’s coastline is a magical way to spend a holiday in this beautiful country. Stretching from the bustling port of Fethiye, to the resort town of Antalya, this coastline has been dubbed the Turquoise Coast for its twinkly blue warm seas. Backed by mountain ranges for almost its entire length, their slopes drop precipitously down to quaint fishing villages and the coastal highway which twists and turns with the coast. Lush pine forest, sandy beaches and sheer cliffs add drama, and the hundreds of tiny secluded coves and bays are tucked away, only accessible by water. The most popular way to explore the Turquoise coast is by sailing, and the traditional wooden gulet cruise boat is a fantastic and authentic way to do this. If you’re looking to spend long, lazy days onboard a typical Turkish boat, with glorious weather to boot, then a sailing trip in Turkey is for you. I recently spent three nights on board a gulet, sailing from Fethiye to Olympus, near Antalya with Alaturka Cruises enjoying a sailing trip along the Turquoise coast, on the route often referred to as the ‘blue cruise’. I tucked into delicious fresh seafood, explored ancient ruins, enjoyed drinks in lively fishing ports and jumped into the warm, calm seas for three days, and it was just brilliant. So here’s my guide to the Turquoise Coast, including how to choose a company to sail in Turkey with and what to do in each port of call. Enjoy reading and have fun planning your own sailing trip to Turkey! Depending on which direction you want to sail in, you need to fly to Fethiye or Antalya. Turkish Airlines and Pegasus both fly domestically from Istanbul and several other Turkish destinations to these seaside ports. You can also reach these towns by bus or train, which you can read more about in my guide to using public transport in Turkey. From the UK or other European destinations, in the summer months (April to October), many airlines fly to Fethiye or Antalya and you should be able to catch a good deal. For prime weather conditions, the peak summer season from May to September is best. In these months, the crowds do swell but the weather is best and you can almost guarantee long, sunny, hoy days – perfect for sailing trips in Turkey! It might seem a little overwhelming as so many companies offer gulet cruises in Turkey. For two day or longer trips, I would definitely recommend Alaturka Cruises. I found them online in advance of my visit. Not only did they have excellent reviews online, but their email support beforehand was brilliant. The price was great value and the dates worked perfectly for my two week Turkey itinerary. The gulet boat that we sailed the Turquoise Coast on was really well-maintained and well-sized for the number of passengers on board. It was so hot during our sailing trip in late August that they recommended we slept out under the stars on deck. We slept on these comfy sun-loungers and it was amazing sleeping with a warm breeze. The crew with Alaturka were fantastic. They were really attentive and fun, but not overbearing at all. We had a crew of three Turkish guys who took such great care of us and gave us great tips and suggestions. I joined the gulet cruise as a solo female traveller and didn’t feel uncomfortable once. The other passengers were from all over the world – including a family from Saudi Arabia, a couple from South Africa and the US, a few other Brits and Americans. Everyone got on so well and the atmosphere was brilliant. With Alaturka, you could also rent your own private gulet cruise boat or yacht with crew if you had your own big group. Depending on the company you go with, it’s unlikely you’d need to bring any bedding or towels. However, you will need lots of suntan lotion, swimwear and hats. The sun can be very strong and there may only be a certain amount of shade onboard. The gulet boats normally have quite a few inflatables and they’re nearly always full board. Every sailing company will have its own policy for alcohol on board. Our gulet cruise with Alaturka offered a self-service bar with an honesty tab, therefore we didn’t need to bring our own alcohol on board. I would recommend one or two evening outfits for the nights you dock in or near a port for the option to go out in the evening. The main sailing routes are Fethiye to Olympus, or the other way round. Fethiye offers many accommodation options. One of the best luxury hotels is the Club Tuana, you can check rates here. Otherwise you can find hundreds of other options covering all price ranges on Booking.com here. In Olympus, there is the very unusual offering of treehouses in this amazing valley town. Although it was the starting point to my gulet cruise in Turkey, Fethiye was possibly my least favourite town along the coastline. The town has experienced some mass overdevelopment in the past few decades and I imagine much of its charm has been lost. I don’t know why, but before I arrived, it seemed to think Fethiye was going to be a quaint village so I was even more disappointed. That being said, it is the starting point for many sailing trips in Turkey so you don’t necessarily need to spend too long there. Its harbour is pretty beautiful but I didn’t particularly like the surrounding streets and restaurant areas. Some of the key attractions in and around Fethiye include the ancient city of Kadyanda and the abandoned ancient Greek village of Kaya Köyü. The first stop for many boats departing from Fethiye is the famed Butterfly Valley. This beautiful secluded cove is only reached by boat. Its important to know that this beach isn’t sand, but instead, lots of tiny sharp rocks – really painful. The beach sits at the entrance to a vast canyon, where there is also a cool off-the-radar back-to-basics campsite and a low-key bar and restaurants offering a cool hippy chilled vibe. It’s called Butterfly Valley as it’s home to a butterfly farm, were there’s a huge diverse range of butterflies. August (when I visited) was not the season to see the butterflies, but the ones I did see were very colourful. have created a campsite and butterfly farm, home to a diverse range of butterflies. Ölüdeniz is one of the most famous beaches in Europe. This stunning beach is regularly voted as one of the most beautiful, so I was really excited to dock here. It really is a beautiful stretch, but as with many gorgeous beaches around the world, it certainly draws crowds and is pretty touristy. No matter which company you pick to go paragliding with, the experience is the same. You depart from the centre of Ölüdeniz in a minibus with all of the paragliding kits and crew on board. It’s one very long and perilous drive to the top of Babadag Mountain. I wondered a few times if the van was genuinely road-worthy enough, but we made it. Ölüdeniz is one of the highest commercial locations in the world where you can paraglide. Together with the breathtaking views and consistently good weather, it is also one of the best places in the world to paraglide. We flew straight through the clouds, which was much like a warmer shower, before swerving sharply and emerging into the most spectacular view. I was really impressed with my guide who I felt really wanted to make it an epic experience for me. He was very keen on making sure we tons of awesome photos and videos, and he really worked the ropes to create a stomach twisting experience. It was amazing! Aside from paragliding, Ölüdeniz is also the starting point for the Lycian Trail, one of Turkey’s most iconic hiking routes. In Ölüdeniz, there are also some great bars and cafes to enjoy some time in if you don’t feel like paragliding. The beautiful harbour town of Kaş has a lot to offer and is a great town to visit along the Turquoise Coast. Its charming laneways are lined with interesting boutique stores, cute cafes, lively beach bars and metres of tumbling bougainvillea. This area is also known for fantastic diving and many dive operators run trips straight from Kaş. Our boat trip with Alaturka permitted enough time to spend the afternoon diving, which was great. We enjoyed fantastic cocktails at Mumi Cafe Beach, which had an awesome atmosphere during the day and I would highly recommend. On the day we were in Kaş, it so happened to be Victory Day in Turkey. This meant that the evening was absolutely pumping. Hundreds of Turks had travelled from all over the country to revel in the town and it was an amazing experience as a tourist. Trying the local ice cream! Enjoying afternoon cocktails with some of the crew and new friends! The next stop along the coast is Kekova, and the magnificent Sunken City here – a UNESCO World Heritage Site. 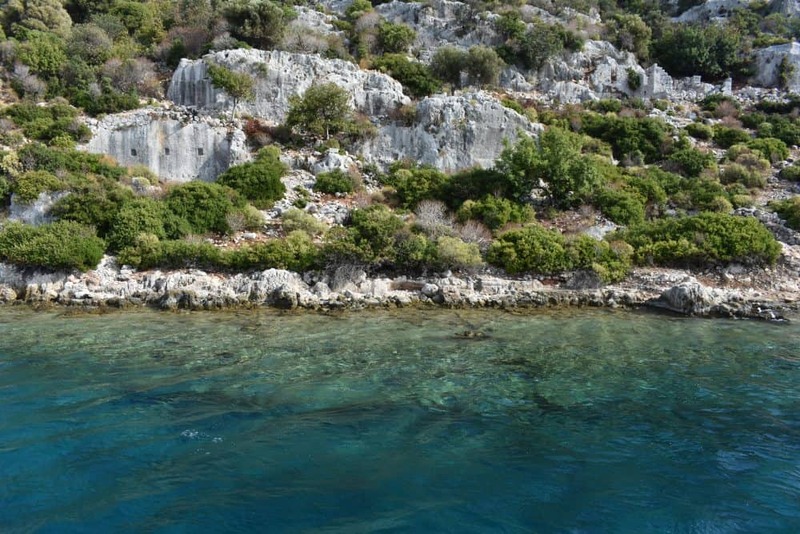 Home to incredible underwater ruins, submerged following an earthquake, this area was once a prominent town in the Byzantine and Lycian eras. Kekova is now completely deserted, except for a handful of goats. This is a no walk, no diving zone. But many boats do sail past each day slowly to take in the incredible site. You can see rooms, staircases and doorways above the sea level, as well as make out pathways and more rooms under the water level. Luckily the water is completely translucent, and is one of the most unusual sites i have ever seen. Along the Turquoise Coast, this tiny, traditional village was one of my favourite spots. Visiting this tiny hillside hamlet was like a step back in time. The ancient Simena Castle is located at the top of the village and is well worth a visit. It takes around 10 minutes of hiking through the tiny village and up into the hill, before you come to the old fortress, once a notable Lycian settlement. Here you will find an incredible panoramic vista over the Gokkaya bay. The heat can be particularly intense here and despite it being quite a short hike, we did completely run out of water. The tiny laneways of the village are lined with local women (and children) selling their homemade souvenirs. They were not pushy at all and I bought several lovely bracelets here. We slept in this bay on our gulet boat – so cool! Lastly, the final spot along the Turquoise Coast to visit (or first if you’re doing this route in reverse) is the hippie town of Olympos. An odd mix of travellers descend on this incredibly beautiful town, nestled in a canyon and surrounded by fragrant forest. It has a tucked away beach and an atmosphere that’s really quite unique. Visitors stay in ‘treehouses’, and the bars are leafy, basic and so, so chilled. If you can spare the time, this is a great place to finish the trip and spend a few extra nights. So that concludes my guide to sailing in Turkey and exploring the Turquoise Coast by traditional gulet boat. I hope this guide proves useful in choosing your own our company to sail Turkey with and gives some insight to the ports. As mentioned, this route is often referred to as ‘the blue cruise’. If you’re considering a longer trip, you might find my two-week Turkey itinerary here useful, as well as my guides to Bodrum, Pamukkale, Ephesus, Istanbul and Cappadocia here. Have you sailed along Turkey’s Turquoise Coast? I’d love to hear if so – drop a comment below, and if you’ve enjoyed this post, feel free to share using the below links! Disclaimer: This visit to the Turquoise Coast in Turkey was entirely paid for by myself and there was no involvement from the tourism board or any local gulet companies. This is an independent guide. Enjoyed my guide to sailing in Turkey along the Turquoise Coast? Pin it! The Turkish coastline you visited looks stunning. I would love to do a boat ride around here. 🙂 Looks like you had a whale of time especially swimming in the water. Your pictures are amazing I had to look at them twice! What an experience that must have been, I never knew Turkey was so breath taking. The paragliding… Wow! I really enjoyed your post looks like a great future vacation. My hubs is currently standing over my shoulder absolutely drooling at the thought of being able to do this kind of sailing. Those views are so magnificent what a lovely way to travel, peaceful, quiet and so beautiful. wow what a fabulous adventure! I would love to sail somewhere one day! I can’t believe I haven’t heard about Olu Deniz before ! Looks like a really nice beach! Your photos are amazing, I love the one of your jump especially ! So beautiful! Picturesque coasts like those make it hard to leave the ship and explore. I could stare at that all day. But thankfully you pointed out numerous amazing things to do. I would thoroughly enjoy the paragliding. There is something about going through clouds that gives you an incredible feeling. Those are some amazing towns – Kas specially. It reminds me of a smaller town in Nepal called Bandipur with its cobbled pathways and bougainvillea. The water here is terrific, I definitely think that it is the best way to explore this coastline. Glad you shared your views on the same. Really? I should definitely look into visiting there too!! 🙂 And thanks for your kind words about my photos! This place is unbelievably beautiful. I’d book a trip here tomorrow if I could. The water looks so refreshing. I love beaches, I could stay here forever and not get bored for sure. The food looks really delicious as well. Definitely adding to my bucket list. The Turkish coastline seems so ethereal. The views, especially the sunset ones, are really breathtaking. I am sure it was a blissful experience cruising along on the turquoise coast of Turkey. The Olu Deniz beach looks gorgeous and the paragliding looks really exciting. Hi Sandy! Yes, truly breathtaking! Thanks for your kind words! Wow this sailing trip around turkey coast was stunningly beautiful. And added bonus the paragliding adventure love to do the sailing trip one day- another list added ti my bucket. Awesome, glad to hear this post has inspired you! It is a truly beautiful coastline!